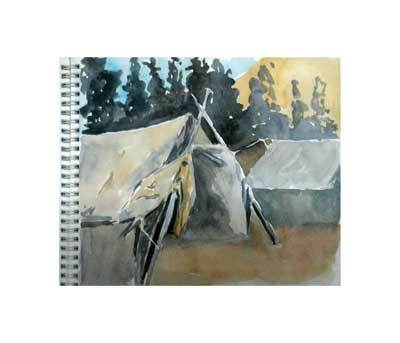 CANVAS TENTS - AFTER SARGEANT. Colours used: Indigo, Ochre, Cadmium Orange, Alizarin Crimson, Ultramarine Blue, Cerulean. Was exploring what the colours the master might have used. This was modified greatly and unlike the work of the master. I am trying very hard to reach Ajis Mohamad, the underwater artist. I want to put him on my magazine cover along with featuring 7 of his paintings in a two page original article. I want to get in touch with Ajis Mohamad. Sorry, I dont have ajis's no.